If you know me, you know I LOVE to entertain. But not your Martha Stewart “entertain”. I don't really believe in the cutesy, food label-y, nametag-y, fancy-schmancy stuff. It doesn't feel authentic to me, and really, the reason you fancy stuff up is to impress your guests. 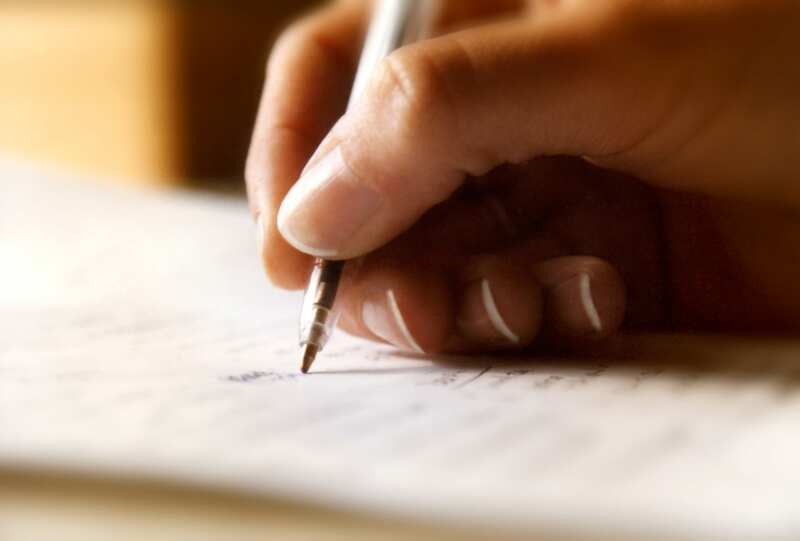 While there is a time and place (like a wedding or formal banquet, for example), for me, I'd rather my guests relate to me and fall in love with our authenticity than our hand-caligraphied bedazzled name plates. Thingies. Forming friendships is something of great importance to Bubba and I since we don't have our families near us. We rely on good friendships to keep us grounded, and help us feel loved and wanted. We have found the best way to form good, quality friendships is to invite people into our home and feed them our food (as risky as that is for a blasé cook like myself). Learn more about how we make friends HERE. First, before planning my menu I checked Deals to Meals at the beginning of the week to see what was on sale. (Remember, you should always plan your meals around what's on sale that week! See how I do all of this HERE). This is really what makes or breaks whether entertaining is affordable or not. I made my menus for the 3 dinners we were having guests over for, as well as Hutch's birthday party. Hutch's party had a separate $100 budget (including location and decor, but more on that later this week), and the meals with friends all had to fit within my $125 weekly grocery budget. Menu: Pasta bar with alfredo sauce, meat/mushroom marinara sauce, meatballs, garlic bread, salad, strawberries, and dessert. 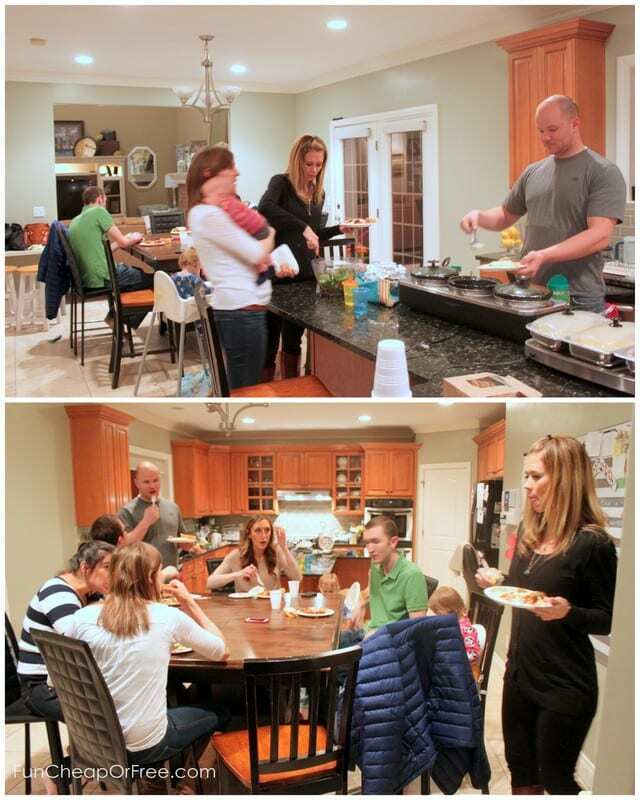 Want to know the real secret to my entertaining success?…my food servers! This crockpot server one is my all-time favorite things everrrrrr. 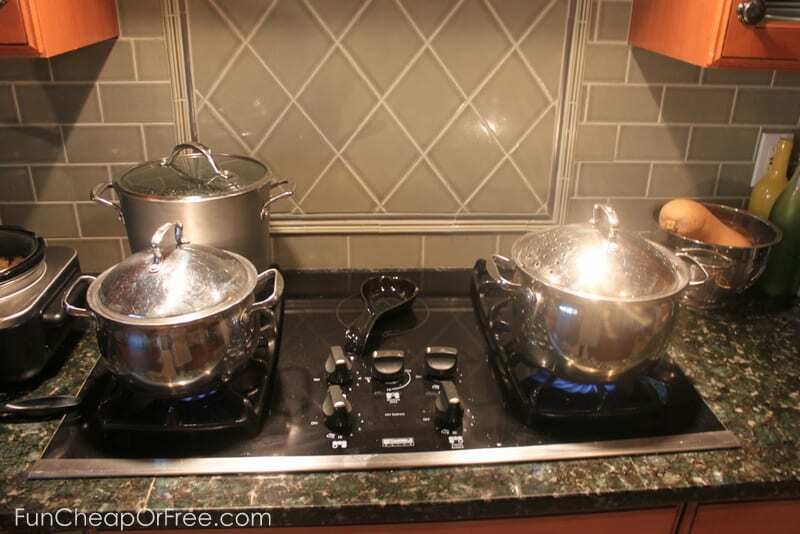 They are 3 independent 1.5 QT crockpots that cook on high, low, and warm settings, just like normal crockpots do. It's a bit heavy and hard to find room to store, but so worth it! For this gathering I put my sauces and meatballs in, left them on low all day, and voila! Done! Keeps it warm and cuts down on dishes. This Buffet Server was another Christmas present of mine from one of the first years we were married. This one is great for non-crockpot-esque food, but this one just warms food (you can't actually cook in it). But it's still awesome for gatherings. I talk about these in detail in my “Feeding a Crowd On The Cheap” post. 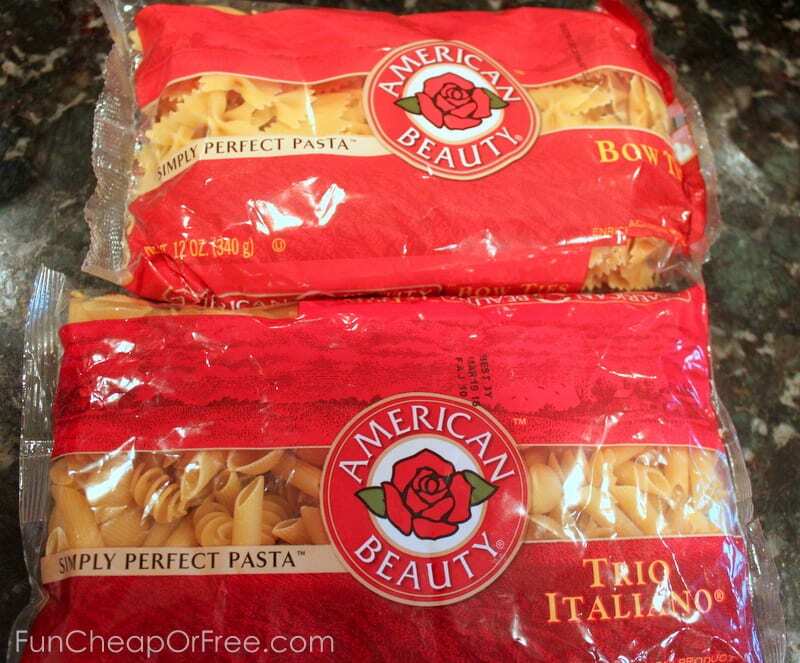 I was able to price-match pasta for…wait for it…$0.49 a BOX this week! Even for the fancy whole wheat/full-serving-of-vegetables-in-every-box stuff which is normally $1.30+ per box! You better believe I bought as many boxes as I could fit in my cart. I chose 3 varieties of pasta to serve – fettuccini , mini bowtie (farfale), and a cool combo blend that I didn't know existed. I boiled them separately because I didn't know if cooking time would vary. Tip: Once you drain your pasta make sure to toss it with a healthy dose of olive oil so it doesn't stick. And be sure to spray your food buffet warmers really well with cooking spray before putting anything in them, especially pasta, or you'll have a sticky, globby pasta mess. …but then I checked the coupon book (you should always do that! 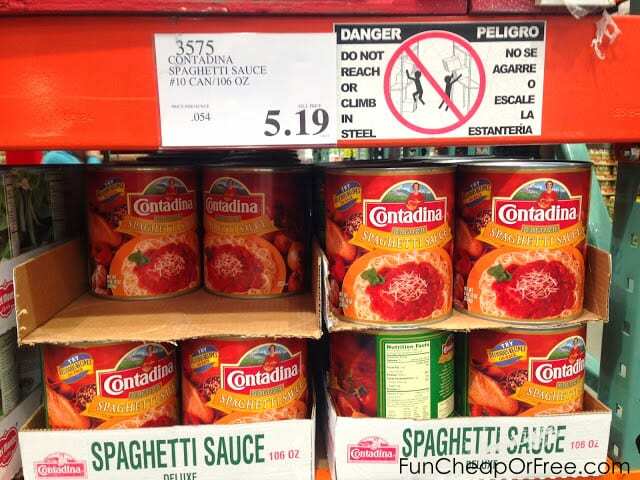 More Costco tips HERE) and saw Prego on sale. 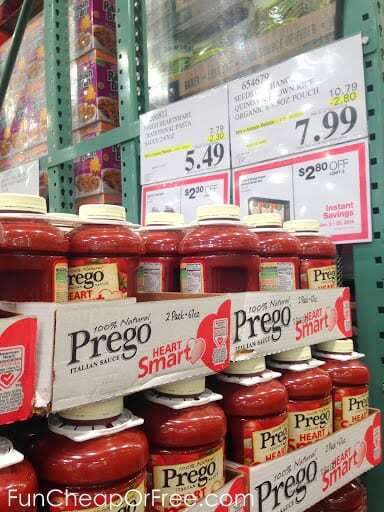 I figured out the price per ounce and saw that the Prego was a better deal, which was great because it was in WAY better containers. While I was there I grabbed a huge can of crushed tomatoes to add to the sauce for texture. Wasn't totally needed, but for less than $3? Worth it to make the sauce better. For my marinara sauce I used one of the Prego containers as a base, then eyeballed italian seasoning, garlic powder, dried minced onion, dried basil, and chopped up a can of mushrooms for texture (though I wish I would've done two cans with how much sauce I made). 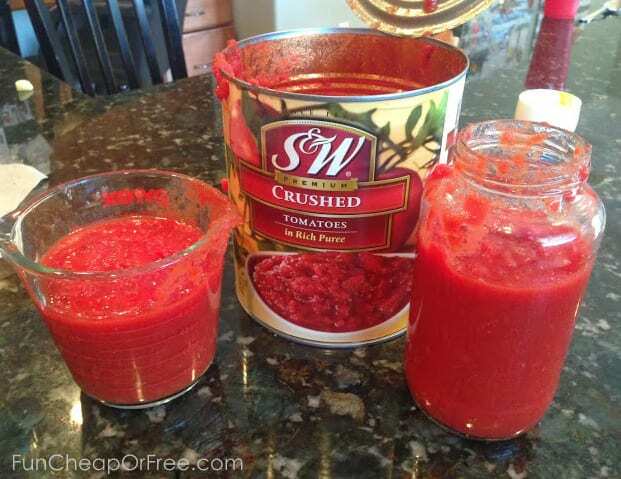 I also added probably 2C of the crushed tomatoes for a chunkier texture and fresher taste. I pulled some italian sausage from my freezer that I had price-matched for a good deal months ago and browned that as well, adding it to the sauce for heartiness and taste. I set it on low in a crockpot and called it a day! I checked it throughout the day to taste the sauce, adding a little sugar to cut the acidity of the tomatoes, or adding seasonings here and there, and even added a little bit of water at one point to thin it out. Didn't measure a thing. And I'm not going to lie, it was DELICIOUS. The bomb, even. *pat on the back*. Oh and I made a HUGE amount of the marinara sauce because I was going to use it for Saturday's dinner as well, which is why it's in a separate crockpot (read below for Saturday info). I took the leftover crushed tomatoes and put it in leftover empty jars that i'm OCD about saving, labelled the jars, then stuck them in my freezer to use in the future (be sure to use our Freezer inventory printable!). Turns out this stuff is SO EASY to make! Melt a stick of butter in a pan. (I said easy, not healthy…) Add 1/2 C cream (I used half and half from Costco – good price there) and some corn starch (maybe 2 teaspoons? I didn't measure…) and whisk it on medium-ish until it bubbles. Turn down the heat and let it simmer (whisking pretty much the whole time) until it thickens to the texture you like. 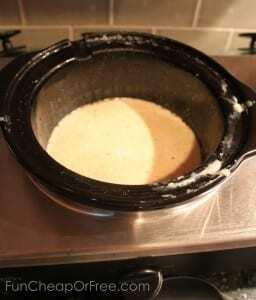 I kept adding cream to it, letting it thicken, added more cream, let it thicken, etc. I needed lots of sauce and I just kept going until I thought I had enough, and it was as thick as I like it. I also added a little garlic powder and lots of pepper for flavor. When it's how you like it, remove from heat and add 3/4 C parmesan cheese (I use the green canned Kraft stuff from Costco). It really AH-MAY-ZING sauce. Once cooked I put it in my crock pot on “warm” for several hours until dinner was ready! P.S…sorry the picture is NASTY looking. We all have talents…photography is certainly not one of mine. What's pasta without meatballs?? I bought a big-ol bag of Costco meatballs for about $15. I could have made my own (they really are easy to make), but I was super busy this week and just found room for it in my budget to allow for the convenience of buying them. Plus, Costco meatballs are so good. And the bag is HUGE! I still have at least 1/3 a bag in my freezer for us to use for the next few months. 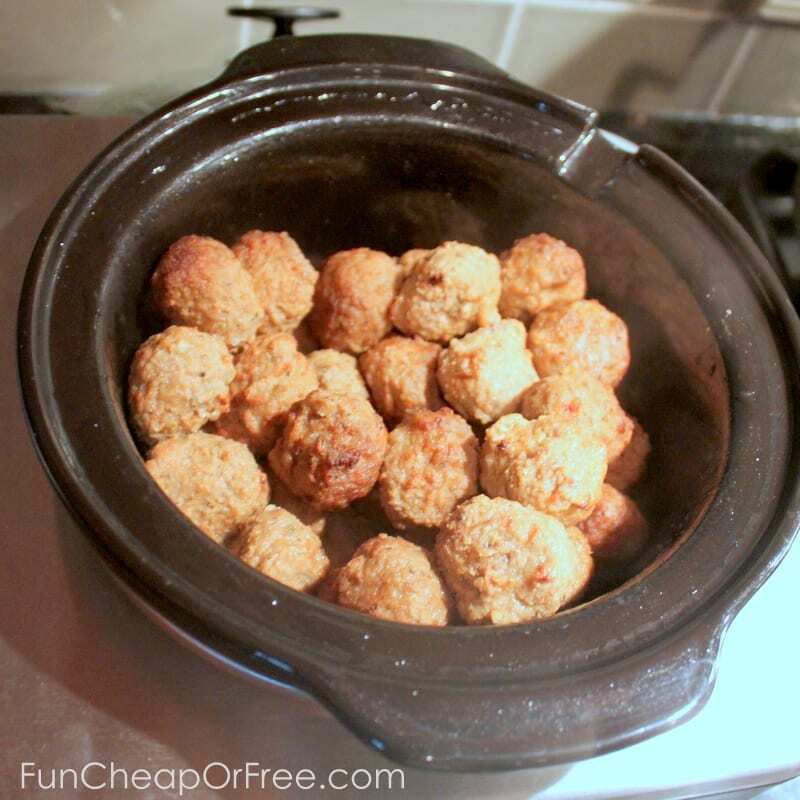 I just put them frozen in a crockpot, put it on low, and ding! Fogettabahtit. They are pre-cooked so you just have to heat them through. I forgot to take a picture, but I took our glass ice cream dishes and made a little buffet of toppings that included: fresh spinach leaves (barely chopped, maybe in half), cherry tomatoes (cut in half), real shredded parmesan cheese, and a store-bought jar of pesto. You've gotta have garlic bread with pasta, right?! Carbs upon carbs?? It's a pasta law, really. 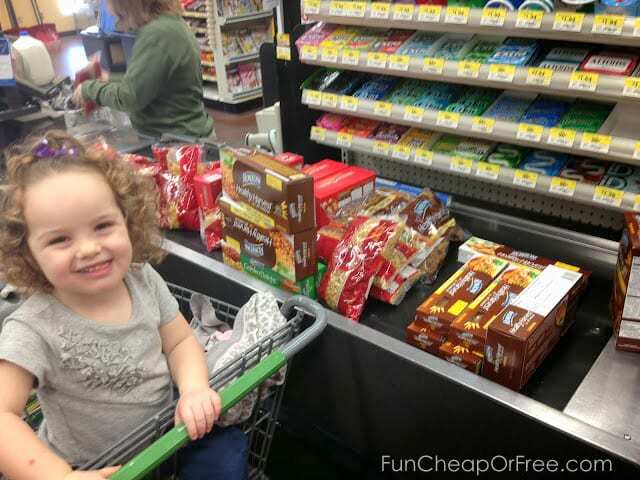 I hit up my favorite discount bread cart at Walmart (yes, any store with a bakery will have one). 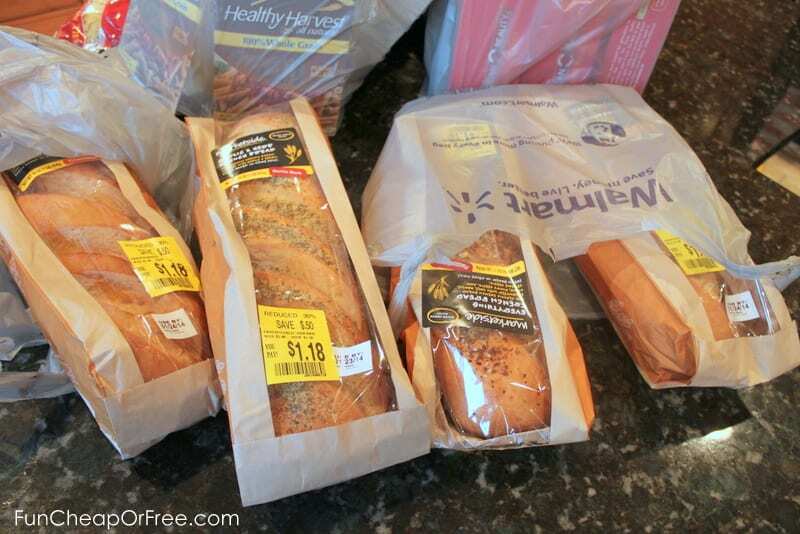 I found fabulous french bread for $0.50 savings per loaf. I promise, it tastes exactly the same! I usually buy a few extra, wrap them well in foil, and freeze them. Bread freezes AMAZINGLY well. For a salad, one of my guests asked what they could bring so I had them bring a green salad. It was delish- it has pomegranate seeds, candied walnuts, and all sorts of goodness in it. Our other guest brought fresh strawberries as their side. Tip: Never feel bad letting your guests bring something! If they ask, LET THEM! And even if they don't ask, Bubba and I will usually send a text that says “dinner at our house friday – bring a side, bring your kids, and let's party!” Literally. That's what our texts say. All the time. Every weekend. It's the cool thing to do. 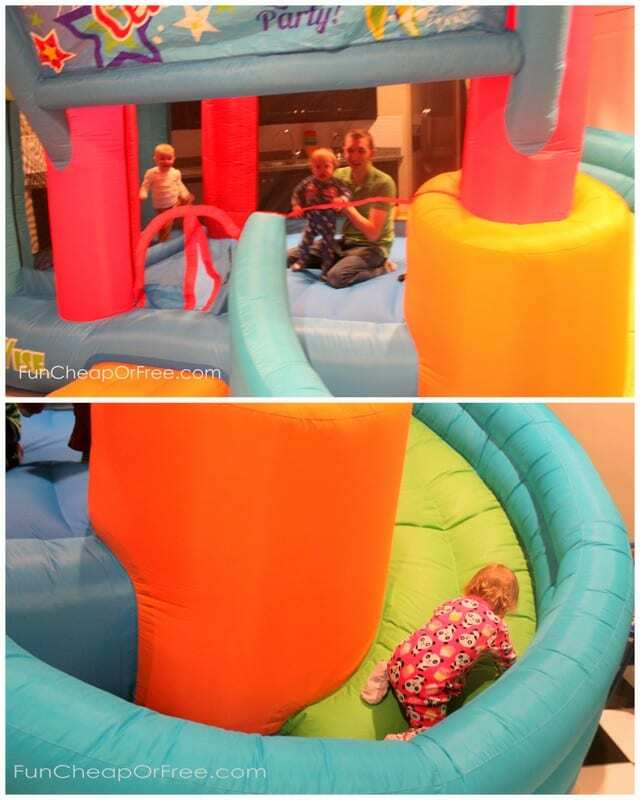 We ate, we talked, we played in the bouncy house, and had a great time. We celebrated Hutch's 4th birthday with 30 friends. I will do a separate post on this soon. My original plan was to make these awesome marinated chicken kabob thingies with baked potatoes and salad. BUT…we had so many sandwiches leftover from Hutch's birthday that morning, we decided to serve those for dinner! We bought a 6-foot sandwich from Walmart for the party (for the adults), and had hotdogs for the kids. 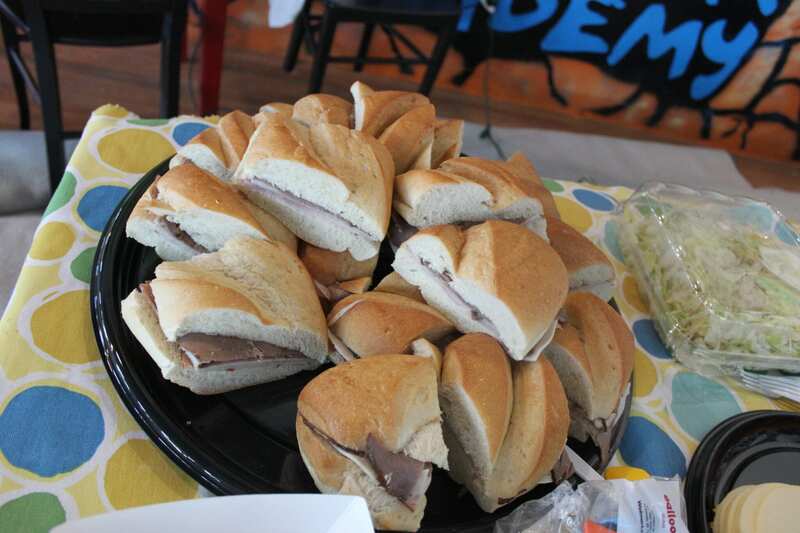 Their 6-foot sandwich is only $32, feeds 30 people, and it's really so so so good! Again, more about that soon, but here's a teaser. We served the sandwiches for the adults, and leftover hot dogs for the kids. We warmed the hot dogs in the microwave and finished them off on our George Foreman grill. We served it all with chips I have hoards of in my pantry from one of my latest shopping trips. I took some of our leftover pasta from our Friday night party, and made a pasta salad out of it! I added some italian salad dressing, parmesan cheese, cherry tomatoes, some fresh spinach leaves, some bell peppers and 1/2 an avocado that were leftover in my fridge. I forgot to take a picture before we all devoured it! It was a last-minute thought that I had as our guests arrived, and it took me less than 2 minutes to put it all together. I used leftover strawberries from the night before, added them to spinach, tossed with parmesan cheese and raw sliced almonds I always keep a bag of in my freezer, and voila! 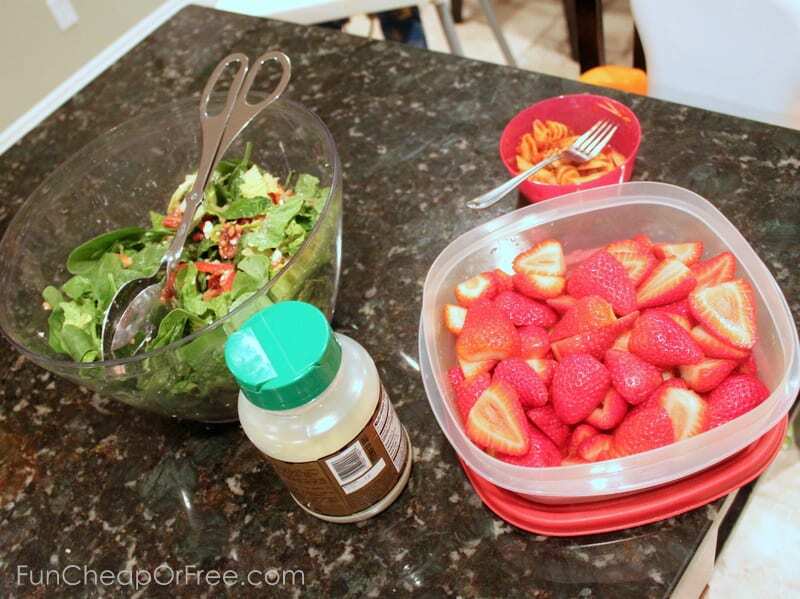 Strawberry spinach salad. I like to serve it with poppyseed dressing. She offered to bring the dessert and brought monkey bread. It was so good, and she said it's really easy to make! For Sunday we had even MORE friends over! Since we have church from 11-2 and were eating dinner at 5, I wanted something easy-peasy and something the kids would like. 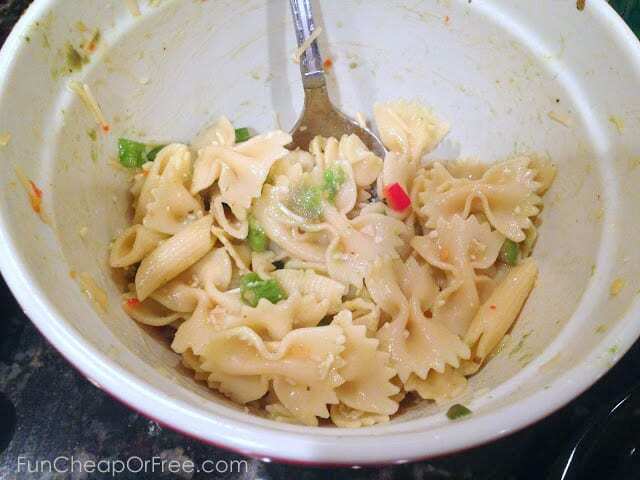 We had so much deliciousness leftover from Friday, I decided to do a repeat pasta bar! For the sauces, I made a fresh batch of Alfredo, but simply reheated the (loads of ) marinara I had leftover. Just for the record, I swear it tasted better after sitting for a day. For the meatballs I reheated any that were leftover from friday, and added some frozen ones that we hadn't used to the batch so we'd have enough. I still have 1/3 of the bag left in my freezer, just for the record. It holds a TON of meatballs! For bread, I baked the other two loaves just as I did on Friday, and used the leftover garlic butter. 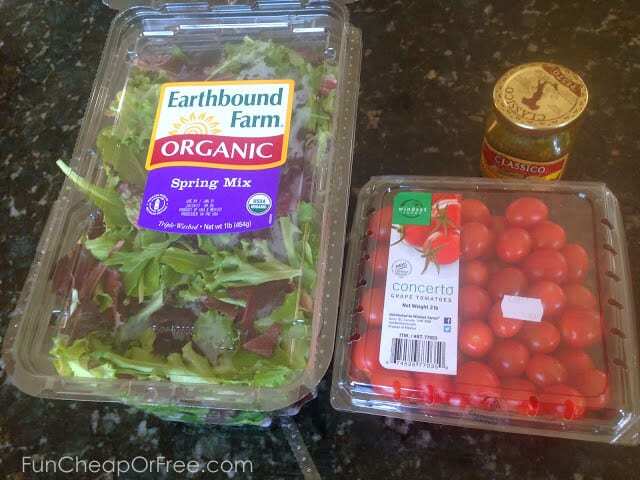 For salad, I bought a spring mix from Costco ($3 or $4 for a huge box, I believe…which, we hardly made a dent in and I shouldn't have bought it). I tossed in some tomatoes, avocado, diced carrots, parmesan cheese, sliced almonds, and served it with ranch and italian dressing since I didn't have caesar. My guests brought a frog eye salad, and a delicious Reece's brownie trifle for dessert. I have never felt so flattered as I did during that dinner! My guests were GUSHING about it. At first I thought they were just being nice, but then I caught on to the fact that they were genuinely in love with it when they went back for (literally) 3rds. It's simple and cheap, but the homemade sauces, variety of choices, and fancy buffet servers (told you they were magic…) made it come off as much fancier than it really was. WHEEW! So there you go. 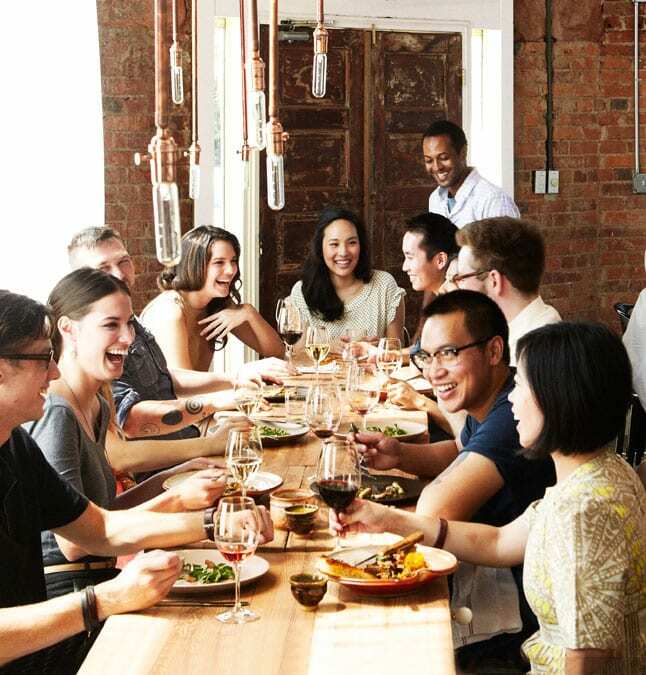 Proof that you can feed a crowd again…and again…and again… on the cheap! I love the pasta bar idea.I cook for friends and family alot and am totally going to use your idea. Please write more ideas for good inexpensive entertaining .I love it! This was such a good reminder to me. I have the crockpot server and the buffet server. I am going to bring them out more often! I really liked how you explained your shopping for the parties. That is where my education is lacking. And you make your spaghetti like I make mine with canned sauce as the base. I like adding stewed tomatoes, too, if I have them on hand because it gives me a few more tastes! Really good to see how you bring together multiple parties. What is a frog eye salad??? Thanks for sharing…I was really wondering how you managed all that entertaining. 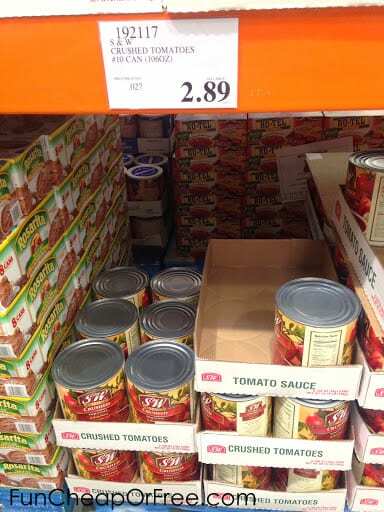 I wish my Walmart was better at price matching and was a full Walmart….it’s hit or miss to get the price matching. 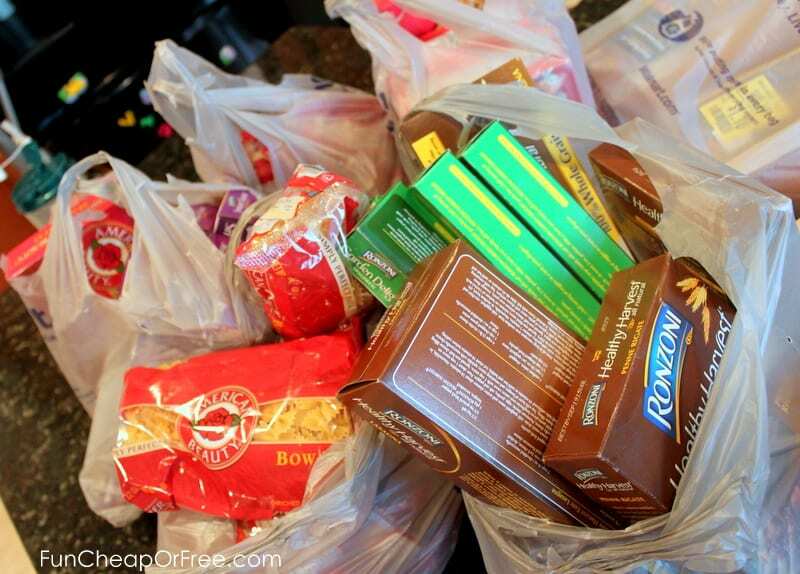 But I’ve learned I can go to two grocery stores and stick to my lists! Joyce Tompkins recently posted…Birthdays, Scrapbooking, and Chocolate….Perfect! Frog eye salad is this: http://allrecipes.com/recipe/frog-eye-salad/. I should totally link to it, thanks for the reminder!! OMGoodness this sounds really good! And since I’ve been doing Deals to Meals for a bit I have almost everything but the pasta. My mom needs gluten free but I’m sure I’ll find a great substitute for the ancini de pepe. Thanks! Ok, this would have done me in for a long time! I stress over having ONE party, much less …….I lost count….but, I would have been a mess! 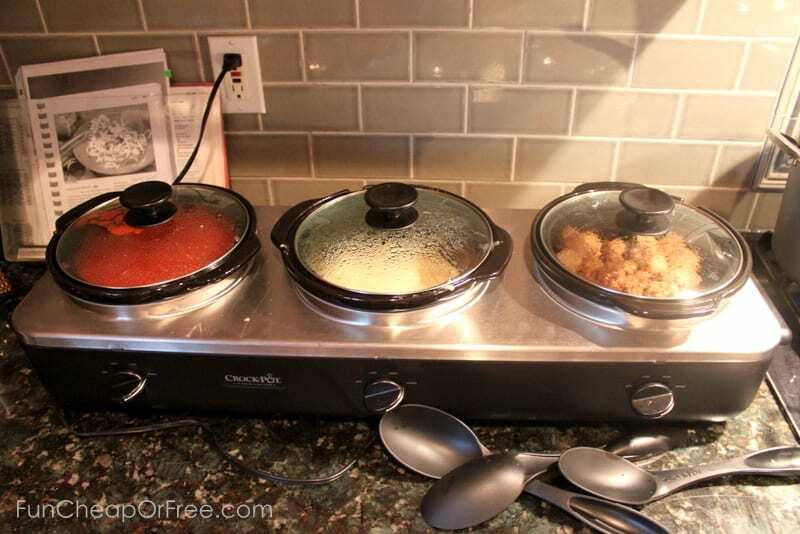 I do love the idea of the warming tray and multi-crockpot thingy! What a perfect way to host a dinner! Maybe if I had one of those I would be a better hostess 🙂 You think? Thanks! I don’t even think of it as a “party” any more, because when I think “party” I think decor, theme, take-home gifts…hyperventilation. It’s more of a “hey, let’s eat dinner…and have some friends over at the same time.” Mentally it’s what helps me. Thanks for sharing! Everything looked delicious! Wanted to share something I found on Pinterest (where else?? 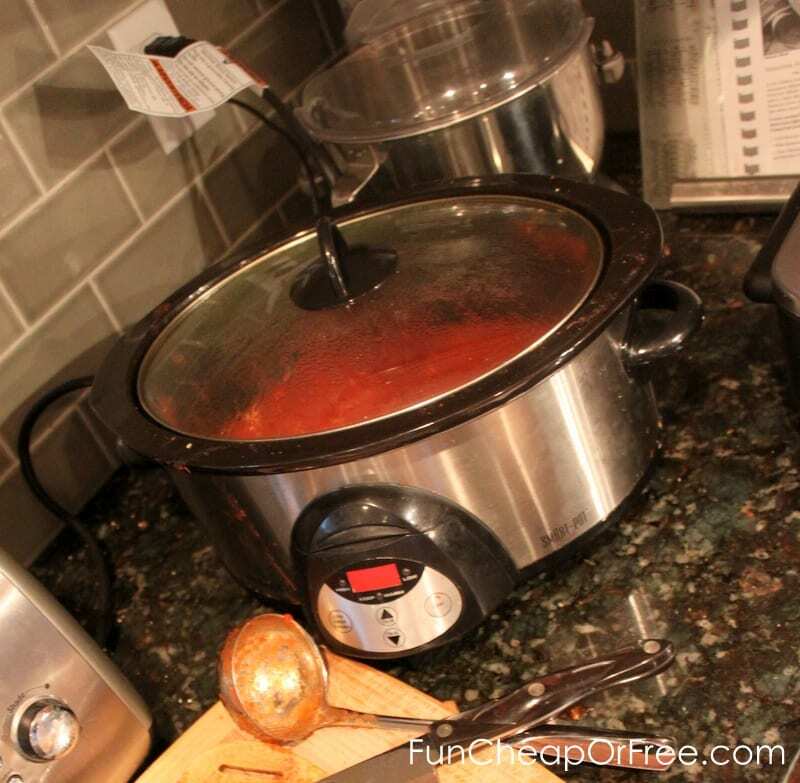 )… You can use your crock pot to cook hot dogs and they are SO good! Just dump however many hot dogs you need in your crock pot, turn it on low, cover, and you’re good to go in a few hours. They taste like they’ve been roasted… Which essentially I guess they have. We did this for my daughter’s first birthday party, and everyone raved about how good they were. And, for people to say that about a hot dog… It’s got to be good, right?! Looks like you had a fun weekend! 🙂 Could you elaborate more how you clean/re-clean your house for multiple parties/guests in a weekend. I would think having all of those kiddos over would make a tornado out of your house. Mine is usually a wreck when we have playdates with my daughter’s friends. It takes me a good day to get it back in order! Thanks, Jordan! That’s an amazing question! I think I’ll do a post on that, actually! In brief, it’s really not that bad! We focus on the main floor. We just vacuum, put toys away, wipe down the toilet/sing/mirror in the bathroom, and wipe everything down in the kitchen before guests arrive. I lock my bedroom because it’s always a disaster 100% of the time. I have the kids pick up their own rooms. I only pick up the basement at about 75% because that’s where all the toys are and I know it will be a disaster anyway. Oh, and be sure to light a candle!! Having a good scent in the house makes all the difference. We start this at the “1.5 hour before guests arrive” mark and everything is usually looking great with 30 minutes to go. But I’ll be sure to do a post on this! Jordan, do your friends ever reciprocate? I find that once you become the “inviter” others seem to count on you to do so and forget that you might actually like to go to their house once in a while. And some just refuse to invite….ever. This is exactly what happens to us! We actually host several “front porch singing” nights per year and everyone has a great time, but that’s where it ends. And, like you, I sometimes wonder if everyone is partying without us or they are just content to be at home doing their own thing. I know this is old now but thought I would weigh in…I would LOVE to host but my house is small even if it’s clean and tidy and just not suitable for having more than 4-5 people in at any one time. I get super embarrassed when more than 4 people come over at a time and it becomes evident that there’s no room. I would much rather attend someone else’s house and bring a dish because I love to cook and help clean up the kitchen than be embarrassed. Definitely not trying to be rude or lazy by not hosting, it just isn’t practical for the next few years sadly 🙁 please don’t think it is rudeness. I really appreciate posts like this! Rather than just telling us to be frugal you showed us a real life example. And you covered so many different topics, from crockpots to your simple recipes to how to recycle your food. Makes it seem so easy. I am one to get overwhelmed with the whole idea, so I never invite people over. Thanks for all this great advice!! 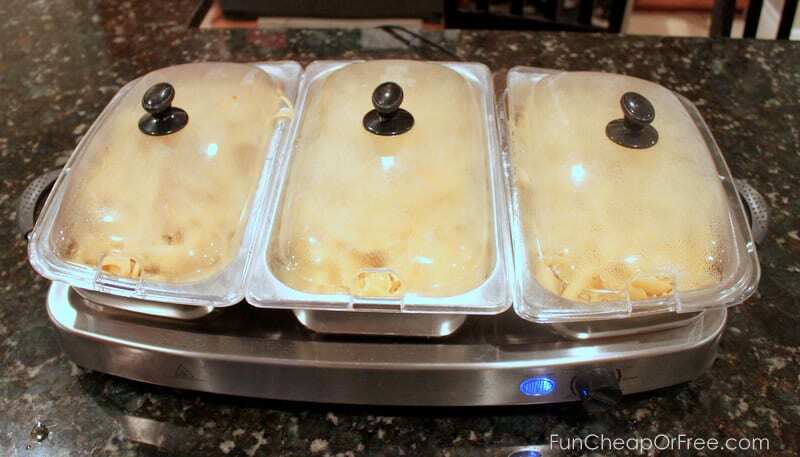 Could you share any other uses for your crock pot server? Just scored one for super cheap but not sure where to find ideas for how to get good use out of it! Thanks! Yes! I actually like to use it for dinner. If I’m making pasta at home, for example, I’ll use one for the sauce, one for the meatballs, and one to warm the sliced french bread (or I’ll just turn it off). Soup is another good one. I’ll make soup in one, cook up some veggies in the other, and warm bread in the third. It’s great for all parties and that’s mainly what I use it for though! I have been eyeing that three crockpot unit for a long time! So convenient! Now I can have more friends over without it breaking the bank! Yay!